The Bter crypto currency exchange that was recently hacked and over 7000 BTC were stolen has officially detailed their plans to return to full operation again and to pay back to users all of the coins that were stolen. Earlier this month the service has hinted that Bter is getting back to normal operation, but now they have resumed trading with improved security and a plan set in motion to gradually return the missing coins back to users. Bter had been the largest altcoin trading platform in the world, with 230,000 registered accounts, including 130,000 Chinese users, daily PV closing to 4 million at its peak. 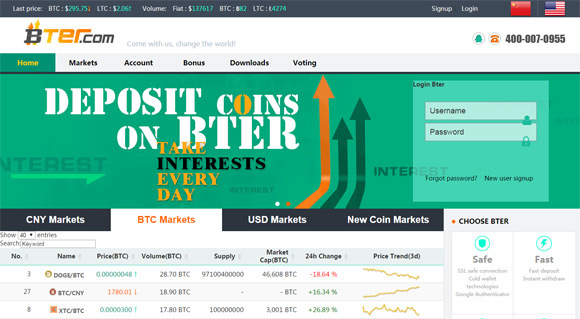 As a once hottest altcoin exchange, Bter had successfully help with the exchange of 890,000 BTC and had a significant and sustainable profit model. 1) Bter shall undertake all the loss and compensate users’ BTC loss in batches gradually. 2) The BTC holders on Bter who suffer the BTC loss shall be entitled to Bter’s half year’s trading fee in proportion to their BTC loss, besides the above the mentioned compensation. 3) The lost BTC balance in the users’ account has been transferred to the BTC_B, which will be the reference for our subsequent payback. 4) All the Bter’s future profit shall be used to pay the BTC loss for users first, until all the lost BTC is paid up. 5) Bter will open more businesses later and the profit from those businesses will also be used to pay the BTC loss for users first. 5) Bter has received 1000 BTC from its partner JUA.COM to speed the payback process. 6) In the further, Bter will seek more finance from other channels to pay up the users sooner. 8) New BTC deposit sending to Bter shall not be affected.